HoB Club is intended for individual use only. Spouses may not share a membership. Points may not be accumulated for a business entity. Accounts may be audited and inactivated at our discretion if fraud is suspected. The HoB program may be cancelled at any time. Member benefits including promotional offers may cease after 6 months of inactivity. The changing nature of the restaurant business requires Walter’s Steakhouse to adapt and modify its program rules from time to time. We will notify HoB members of any changes on our website. You should occasionally check the rules on the website. 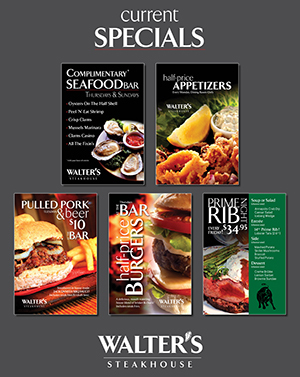 Staff members of Walter’s Steakhouse will refer members to the website for all questions. You should check the website periodically as they are and will be the authoritative statement of the rules. Your continued participation in the program constitutes consent of any changes. 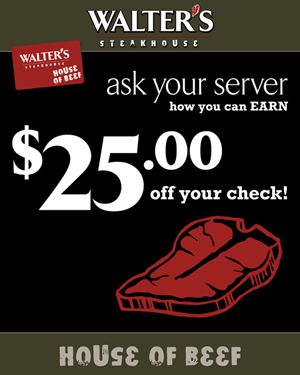 Walter’s Steakhouse employees and family members (defined as spouses, children, parents or grandparents) or people living in the same household as WSH employees are not eligible to participate. Spouses of members must have their own membership to participate. Walter’s Steakhouse reserves the right to audit at any time. Walter’s Steakhouse may terminate membership if fraud is suspected. Points are accumulated at the rate of 1 point for every $1.00 spent on food and beverage, and may only be redeemed in $25.00 increments. Points are credited to your account when you tell the server you are a member of the House of Beef club. Points may not be earned for the purchase of gift cards. Points may not be earned on purchases paid with complimentary gift cards or gift certificates. These forms of payment have no cash value. These complimentary cards and certificates are marked on the front or rear. Points have no cash value and may not be redeemed for cash. Points are non-transferable, and non-divisible and may not be combined with other member’s accounts.